An Ayrshire dessert business has agreed a new partnership with Brakes Scotland, enabling the producer to make its cakes available UK-wide. 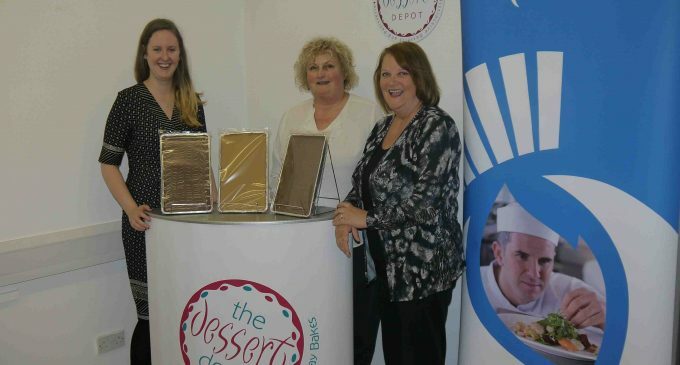 Founded by sisters Frances Barron and Ellen McPherson in 2003, The Dessert Depot supplies cafes and delicatessens across Scotland. With this new geographical reach, company will be able to expand its own brand within the Brakes portfolio, starting with 10 products available across the U.K. this year. MD Frances (pictured middle, with L-R Brakes Scotland’s Lorna Allison and Dessert Depot’s Ellen McPherson) said: ‘We feel this partnership is testament to the strength of our company and to the talent and loyalty of our staff. One of the largest foodservice providers in Scotland, Brakes Scotland supplies 11,000 corporate and independent customers and enjoys partnerships with over 60 Scottish producers and suppliers, including Edinburgh Woollen Mill, the Crieff Hydro family of hotels and the majority of schools and hospitals in the U.K.